It is often needed to give the user the ability to choose among various options when creating an application. In that case, the UIPickerView it’s a nice (and many times the best) choice to do that. The UIPickerView can be easily created using the Interface Builder, but unfortunately Apple doesn’t allow us to change its height through IB. Besides that, sometimes there is the need to create it and place it on-screen manually (programmatically) for a lot of reasons. To create and manage UIPickerView programmatically it’s not that hard. In general, three things have to be done. First, declare an UIPickerView object in our .h file, synthesize it and release it in the .m file. Create our UIPickerView and set it’s properties (depending on what we want to do). Create all the methods needed to display data and manage our selections on UIPickerView. For the purpose of this example, we’ll create a new project named PickerviewTestApp. Our .h file is almost ready. Two things are remaining to be done. We need to declare a UIPickerViewDelegate and UIPickerViewDataSource in order for our picker view to work with our data. Great. We are ready to go for implementation now. Open the .m file and “synthesize” our objects. In the viewDidLoad method we are going to setup our data array and create the picker view with all the properties we want. // Init the data array. // Add some data for demo purposes. // Calculate the screen's width. // Calculate the starting x coordinate. // Init the picker view. // correctly if you don't set it. // Set the picker's frame. We set the y coordinate to 50px. // picker view that highlights your selection) to be shown. // Allow us to pre-select the third option in the pickerView. // OK, we are ready. Add the picker in our view. The picker view is ready. One thing left, to add all those methods needed to make it work properly. To tell our app how many components we have in our pickerView. To tell our app how many rows we have in our component. To display the text of each row. To do something when a row is selected. // Total rows in our component. // Display each row's data. // Do something with the selected row. Ready to go. Build and run your app to see the result. 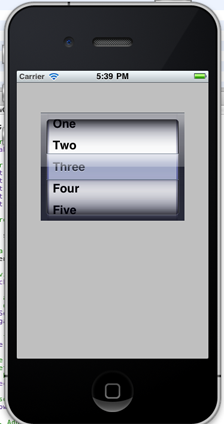 Now we’re having a working UIPickerView, we can extend it a little more. As you will see when the app is running, each row’s text is aligned to the left and of course the only formatting exists is the default one. The question is, how can we add custom font formatting and alter the alignment of the text in the picker’s rows? The answer is by using a UILabel. We need to use another method for this purpose, in which we’ll create a UILabel, set all the properties we want and return this one instead of returning a single string with row’s text. // Get the text of the row. // Create and init a new UILabel. // We must set our label's width equal to our picker's width. // We'll give the default height in each row. // Make the text color red. // Clear the background color to avoid problems with the display. Note that the return type of this method is UIView * instead of NSString * we had in the previous one. That’s all. I hope the code to be proved useful. Enjoy coding and feel free to experiment on your own.